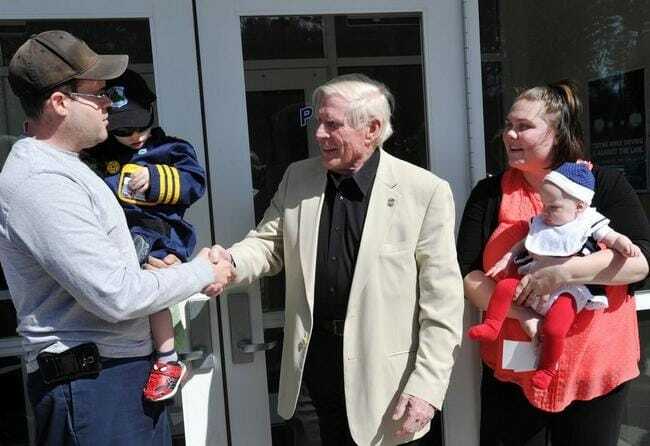 HOLBROOK – Standing outside the Holbrook Public Safety Building, the Fisher family accepted a meaningful gift from a former top cop on Thursday. The Fishers were awarded $10,000 by the Cops for Kids with Cancer Foundation for their two children, P.J. and Jovi. Both are currently undergoing cancer treatment, which brought the foundation out to assist. P.J., 2, and Jovi, five months, both received $5,000 from the foundation and were presented the heartfelt aid by former Boston Police Department Superintendent-in-Chief Robert Faherty. Faherty started Cops for Kids with Cancer more than a decade ago, and it continues to regularly hand out thousands of dollars to local families in need. Photo: Cops for Kids with Cancer Chairman Robert Faherty, center, is thanked by Paul and Kate Fisher after the family was presented $10,000 from the foundation for their children, P.j. and Jovi. Both their children are undergoing cancer treatments.